I'm tempted to ignore the Boston terrorist attacks on this blog altogether because so much of what I would have to say about it has already been said in other posts about mass shootings and such. I'm not saying that a random shooting by a deranged so-and-so and an act of political and/or religious terrorism are equivalents—except possibly in the net effect: death, destruction, and fear—but the reaction of the public is similar in many ways. If I were a victim of this terrorist attack myself or if I were the friend, family member, or even casual acquaintance of someone who was, you can be sure I'd be asking why. There's something almost dizzying and existentially vertiginous in the realization that—of all the billions of people on this planet—fate has selected you (or someone you love) to be blown to bits or crippled by a capricious act of malice like the Boston bombings. You could have been anyplace on earth, but you were there. 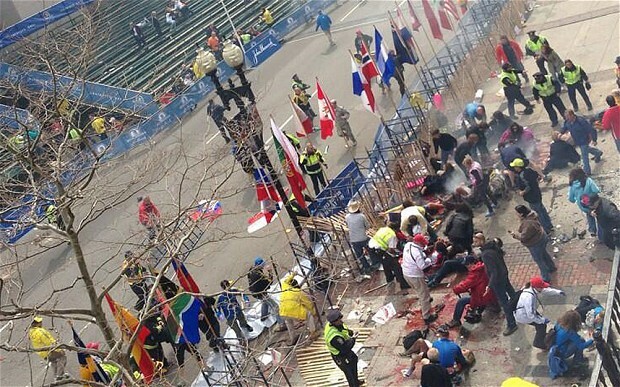 And the Tsarnaev brothers could have picked any number of sites, but they picked the Boston marathon. This frightening contingency makes me wonder if some of the injured or dead perhaps almost didn't attend the marathon or were persuaded to attend by someone else. Because we are the subjects of our own stories, these seemingly little choices take on an appalling significance. On the other hand, when we live across the country and have no personal relationship to the city, the event, or the victims, how entitled are we to the question of why? I know, this seems like an odd phrasing. How are we not entitled to ask any question we wish? Or feel any way that we happen to feel? I guess I'm speaking of some other kind of entitlement—perhaps an ethical entitlement, but I'm not exactly sure. Do we have a right to be shocked or outraged when we are bombed, given that we have been bombing the Middle East rather indiscriminately for years now? Right wingers insipidly call this kind of questioning 'blaming the victim' or, worse, justifying the terrorism, but that isn't it at all. It's useful to remember that when our innocent civilians were killed by terrorists, as in 9/11, our public seemed to cry out for a quick, haphazard military retaliation, which in turn caused the death of other innocent civilians in other countries. To be surprised or outraged by this terrorist act (in the abstract) seems obnoxiously naive. Our actions as a nation—whether right or wrong—have consequences. Unfortunately many of us today don't even possess an elementary understanding of global politics or the thorny involvement of the United States therein. Nor do most of us have an interest in the troubled history that got us to this point. Despite all that the U.S. has done, we choose to view our nation as victimized by misinformation and irrational prejudice. The facts tell us, however, that many countries' resentment of our foreign policy is all too rational. We ourselves would never stand for being treated as we treat other nations, with an impunity fortified by the electorate's ignorance and our confidence that might ultimately makes right. Does any of this justify the terrorist attack in Boston? No, certainly it doesn't. But it's curious that not many people seem to fret about the justification for our nation's own acts of terrorism across the globe. Many might balk at my use of the word terrorism here. How can it be terrorism when it's perpetrated by a national military with 'moral right' on its side? Well, the very first definition I consulted for the word terrorism called it 'the use of violence and intimidation in the pursuit of political aims.' In this sense, is there any greater terrorist on earth at this very moment than the U.S. government? Many innocent civilians (who are far too poor and immersed in the struggle for mere subsistence to have a clear ideological agenda) die because of the decisions made by old white men in navy blue suits and U.S. flag lapel pins. These people are representing us. To the extent that we do not speak out against them or vote to remove them, we share in the moral responsibility of their actions. We often react to terrorist attacks on the U.S. with an indignation that is incompatible with the truth. Without any curiosity about or even suspicion of a history which informs these acts, we are affronted beyond all measure. In my estimation, this is the most frightening reality of all. Because of us, people suffer and die, and we are complacent and even bored by it all. We choose not to even know what's really going on in the world because it's so much easier to believe in the discrete moral categorization that the government feeds us. We understand the bombings in the way we are intended to: we have been violated by the enemy. But we're too busy with reality television and sporting events to wonder how we arrived at that moment a week and a half ago when two young man wanted to kill us indiscriminately, viewing us as a homogeneous enemy similar to the one we see when we look to the Middle East.